Great new golf cart accessory! Due to the front bumper design of the Club Car Precedent, adding aftermarket lights has been difficult at best up to this point. We now have a great solution. We're offering a black powder coated steel brush guard shown below, which mounts right where the stock bumper goes using existing holes and hardware. The steel brush guard will protect the front end of your Precedent, while at the same time, provide you a great place to mount lights due to the light mounting tabs on this product. 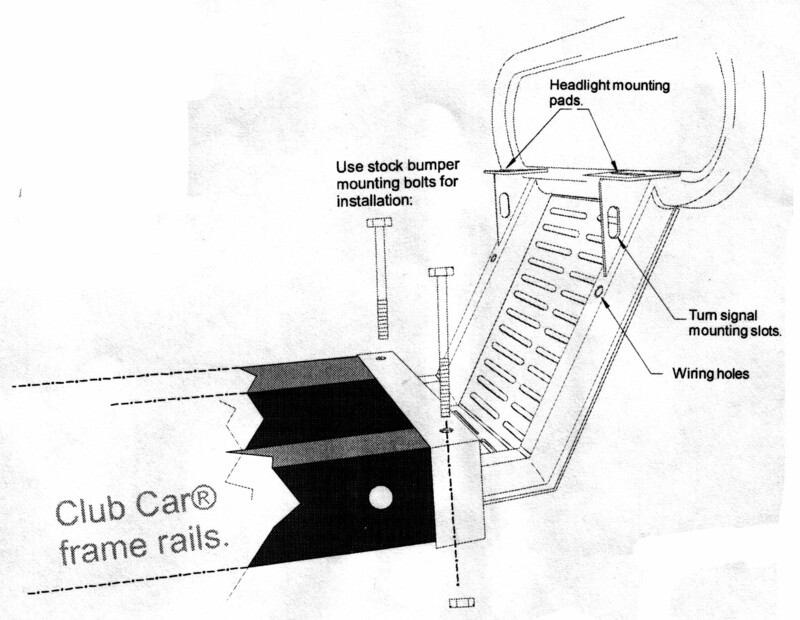 This guard will only fit the Club Car Precedent gas and electric models from 2004-Up. It is not designed to fit the DS models. On this page, we'll present several options. The basic brush guard does NOT include the lights shown below, UNLESS specified through the drop down menu below. Please click the "Related Documents" link just below the price above to see the Mounting Orientation for this light bar. This package is highly configurable as you can see from the options above. We do not list all of the lights that will fit the guard from this page. If you see other lights on our site which you would like to use in conjunction with this guard, please call us at 1-800-328-1953 and we'll gladly check the fitment for you. The Option Packages above do NOT include complete wiring for the lights. They only include the guard and specific lights mentioned. We also offer a Generic Head Light Wiring Harness (including harness, relay, fuse, and switch) or a Generic Head Light/ Tail Light Wiring Harness (includes same parts as above, but will also allow for tail lights) if needed.